Can't decide between the Character Appearance and Snapshot Party Photo add-ons? Enjoy both and SAVE with this party experience bundle! Go Glow! Turn down the lights and turn up the fun. Pump Up Your Party with special FX lighting for a special birthday party that will leave a lasting impression with all of your guests. This is an amazing party experience that kids won't forget. Add to the excitement by having party guests dress in glowing attire like white, neon or glow-in-the-dark clothing! 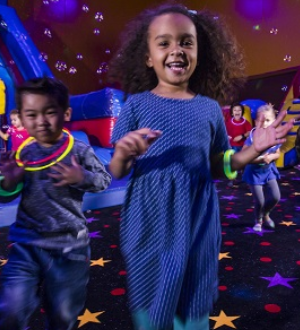 Consider having a late night pajama party, a Bar/Bat Mitzvah Celebration, a Sweet Sixteen, a Graduation Party or just a Super Spectacular Birthday Party at Pump It Up! Along with our awesome FX lighting, our Glow Package includes cool glow necklaces & bracelets for the entire party plus a glow baton for the birthday child. Bounce around with a 20-minute surprise character visit from one of our characters! Choose from Chase, Olaf, Sponge Bob, Patrick, Ninja Turtle Michelangelo, Stuart the Minion, or a Teddy Bear. Includes: Inflatable Ball, Claw Grabber, Flipper/Barrel Game, and Water Game. Contents may vary. This bag includes a variety of fun toys to enjoy! Crayons, candy, a whistle, spinner toys, balloon ball. Contents may vary. Great for kids on the go! 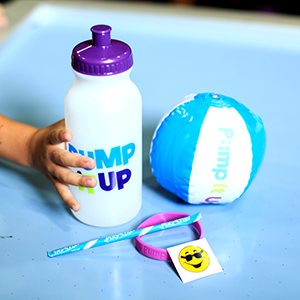 Pump It Up branded colored Water Bottles filled with a Tattoo, Slap Bracelet, Stickers, Inflatable Beach Ball & Candy! 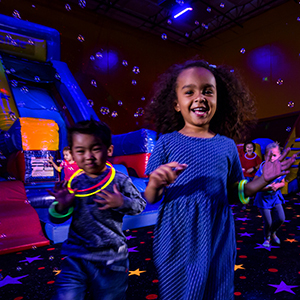 Looking to throw the best kids birthday party in Raleigh?